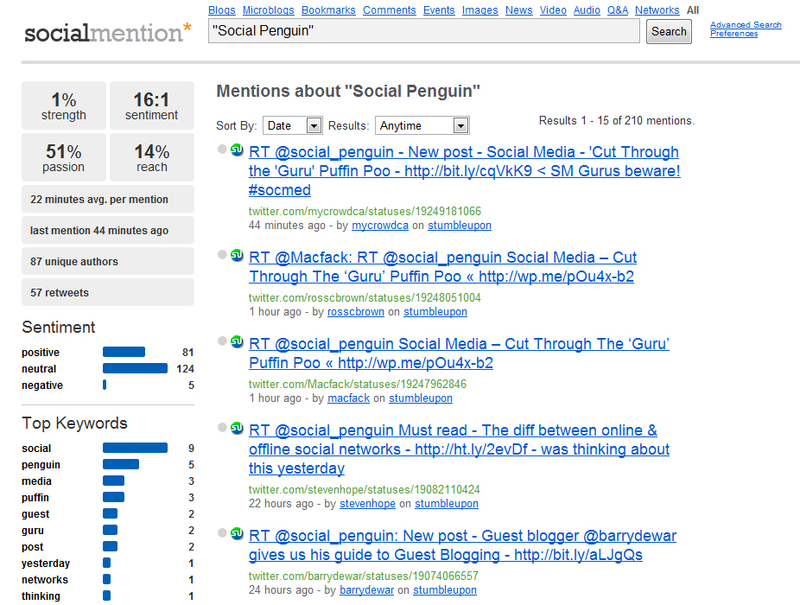 Back in April the Social Penguin blog featured my very first guest post on the analytics behind Illegal Jacks successful use of social media marketing. It caused a bit of a stir at the time because I jokingly called analytics’s a “black art” because whilst it incredibly easy to do, a lot of people are still intimidated by social media analytics. In a bid to try and dispel some of those misconceptions I’m going to a closer look at some free online social media analytic tools that anyone can learn to use themselves. It’s a common mistake these days, because the majority of the tools and platforms can be accessed free over the internet, but social media isn’t free. Organisations forget that they have to pay someone to do all this work, either in house or through an agency, and engaging with people properly through social media can eat up a lot of hours. This is why your analytics are so important, so you can show a decent return on investment on the time (and money) you’ve ploughed in to it. So if you are going to use these free tools to measure your campaigns be sure to account for the time you spend doing it. How often should you gather metrics? It depends really on how active you are in social media. If you are only using it for buzz monitoring then once a month would be acceptable. However if you have an active campaign I would recommend every 2 weeks as a bare minimum. One of the major limitations of these tools is the restrictions set in the Twitter API which means they may only be able to search back 30 days, (in some cases it’s as low as 7 days) so after that time you won’t be able to access those figures. It’s best to do a little digging around on the Twitter API Wiki and find out just what the current API limits are so you won’t be caught out by the restrictions and lose your metrics. 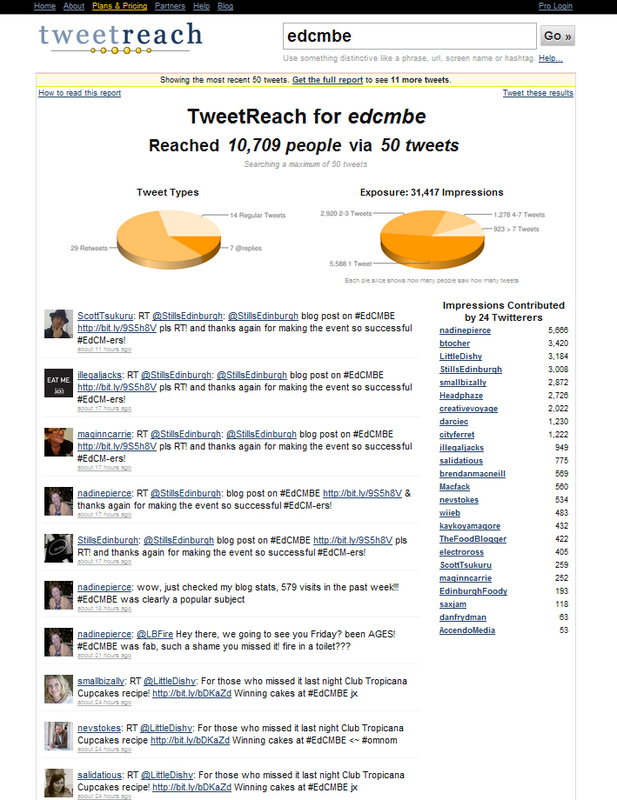 One of my favourite tools to use when trying to track hashtag usage is Tweetreach. The tool will provide numbers and graphs detailing a search terms exposure and also can provide the information in a handy downloadable pdf format (great for storing your metrics offline.) Searching back through 50 tweets it will give numbers on impressions, top contributors and whether people saw the term as a tweet, retweet or @ message. One of the major draw backs to this service are the restrictions, the search function is limited to only the last 7 days and if you want to include more than 50 tweets you have to fork over money. (Even then the paid for service is still limited to 1500 tweets.) However Tweetreach does get major points for explaining in plain English where the get their numbers from and how you should interpret the figures. In an area that many find confusing it’s great that some tolls go out of their way to keep it simple and explain everything to you. Until recently I used to be a big fan of Ice Rocket for satisfying all my buzz monitoring needs, now Social Mention has stolen its place. Social Mention is essentially an aggregator for user generated content that will search over 80+ social media sites for the search terms of your choice. You can choose to separate your search in to only things like blogs, comments, videos etc or go for an overview of your search term on all channels. It also has a wealth of information about the content it has found for you. Sentiment is a really useful tool that looks for at whether the mention was positive, negative or neutral and it also provides a list of keywords associated with your search term. Other great features include the ability to set up email alerts for search terms and being able to easily download your data in to a csv file. The only gripe with tool is that it presents numbers on things like “strength” and “sentiment” without telling you how it calculated them. This means these numbers could be pulled from anywhere (like out of the clear blue sky or a magicians hat) and you have no way of knowing how credible they are. When using twitalyzer the onus really is on the user to pull out the information they need, and whilst it’s great to have all these numbers I’d question just how useful they are to the average account owner. An honourable mention has to go to Twoolr.com as an up and coming analytics tool. It’s still in beta though I’ve had a play around and been very impressed at the presentation, transparency of data and the kind of stats it’s providing. It’s definitely one to watch once it’s finished testing. You may have also noticed the absence of any mention of Hootsuite‘s inbuilt tools, this is because they are part of a dashboard app rather than a stand alone web app. However the tools available through Hootsuite are very good and if you want to read more you can check out a great review of them at the Attacat Brain. I won’t name and shame here but whilst there are some fantastic tools for you to use there are also some really bad ones to avoid. The worst offenders are tools that give your account a score or rank…because they’re totally worthless. You may be impressed by something that’s scoring you high but remember the likely hood is that its only based on the last 30 days of usage so you never get to see that score in context of your entire history. I should also mention they are easily abused, I’ve seen developers using their own tools to claim they to have higher scores than accounts with over 500k followers, nothing quite like blowing your own trumpet is there? 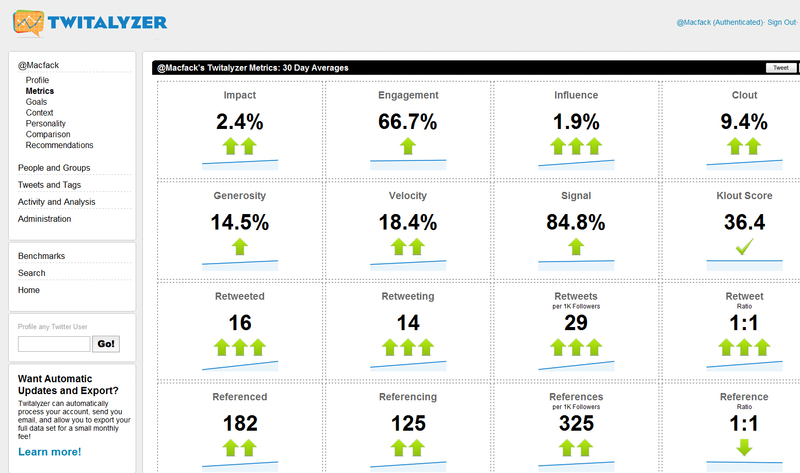 As Bob Dylan sang the times they are a changing, the same goes for social media analytics. Twitter has been purchasing companies like Smallthought Systems to bring in the expertise to integrate analytics tools in to the Twitter service. There haven’t been any hard announcements yet, just lots of massive hints on Twitter’s development blog, so no one knows when this will be available to the public but it’s sure to knock a lot of competition out of the ball park. It’s definitely worth watching the Twitter Blog for further information about the kind of metrics this service will offer Twitter users when it does launch. It’s definitely a project we’ll be keeping an eye on and giving you a review of its services when it launches. Check out the original post over on the Social Penguin blog for the comments attached to this blog post and please feel free to add your own to the mix. Great post, great tools, Thanks.